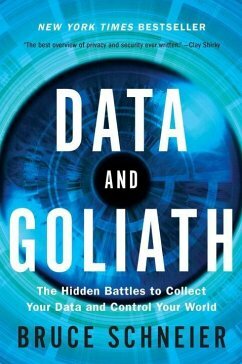 Foremost security expert (Wired) and best-selling author Bruce Schneier shows how data has led to a double-edged Internet - a Web that gives power to the people but is abused by the institutions on which those people depend. In Data and Goliath, Schneier reveals the full extent of surveillance, censorship and propaganda in society today, examining the risks of cybercrime, cyberterrorism and cyberwar. He shares technological, legal and social solutions that can help shape a more equal, private and secure world. This is a book everyone with an Internet connection - or bank account or smart device or car, for that matter - needs to read. Bruce Schneier ist Mitbegründer der Counterpane Interet Security Inc., einem Unternehmen das auf Sicherheitsbeobachtung spezialisiert ist. Sein Buch Applied Cryptograpghy wurde in den USA ein Bestseller. Schneier hat die Blowfish und Twofish-Encryption-Alogrithmen mitentwickelt, zahlreiche Beiträge zum Thema digitale Sicherheit verfasst und ist ein gefragter Redner.